Now Sourced from Organic Camu Camu! Vitamin C is an antioxidant. It is needed for tissue growth and repair, adrenal gland functions, healthy gums, skin and blood. It also aids in the production of anti-stress hormones, is needed for metabolism, protects against harmful effects of pollution, protects against infection, and enhances immunity. Without it you can bruise easily, have wounds that don't heal, gum problems and aching joints. Why do we need to take Vitamin C supplements? As a place to start, there are only 3 mammals on planet earth whose bodies do not manufacture the Vitamin C they need. These are the guinea pig, the rhesus monkey, and humans. The way all three must get the Vitamin C they need is through what they eat and supplementing. Most of the supplements you find in health-food shops, drug stores and supermarkets contain vitamins that are man-made chemicals and minerals that are just ground up rocks or mineral salts. These man-made vitamins and minerals are often labeled "Pharmaceutical Grade" or "USP" (United States Pharmacopeia). The U.S. Pharmacopeial Convention (USP) is a scientific nonprofit organization that sets standards for the identity, strength, quality, and purity of medicines, food ingredients, and dietary supplements manufactured, distributed and consumed worldwide. For example, most of the Vitamin C sold in the US is ascorbic acid by itself. Ascorbic acid can be found in an orange, tomato or broccoli, or any fresh fruit or vegetable. Ascorbic acid is manufactured in chemical plants by adding chemicals to glucose (sugar), applying heat and pressure, which converts the glucose to ascorbic acid. Ascorbic acid, being a more of a chemical, isn’t easily absorbed or utilized the way food is, and can often upset the stomach and digestive tract because it is an acid. Some companies will combine ascorbic acid with other chemicals to buffer it (make it less acid). These buffered versions are the sodium ascorbate or calcium ascorbate forms of ascorbic acid. RHP® Vitamin C contains only organic camu camu extract, a real food source of vitamin C, that is highly bioavailable because it literally is a food! 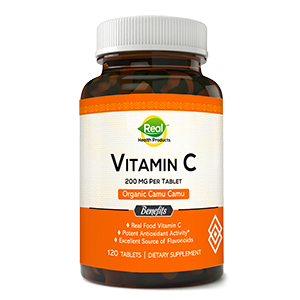 It is vitamin C in a whole food extract which contains bioflavonoids, protein and all the other food factors that enables the body to absorb, retain and utilize this vitamin C much more efficiently. RHP® Vitamin C will not upset the stomach and digestive tract. You can even take it on an empty stomach. RHP® Vitamin C is now available for you and your family. We are currently offering a 120-tablet bottle for $27.70. 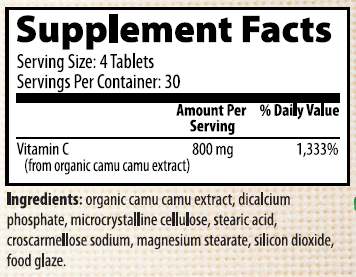 You aren't going to find a better deal for vitamin C sourced from camu camu. Don't wait to get your bottle! Order your RHP® Vitamin C or call us toll-free at (888) 580-9390 with any questions. Order the RHP® Vitamin C Now!